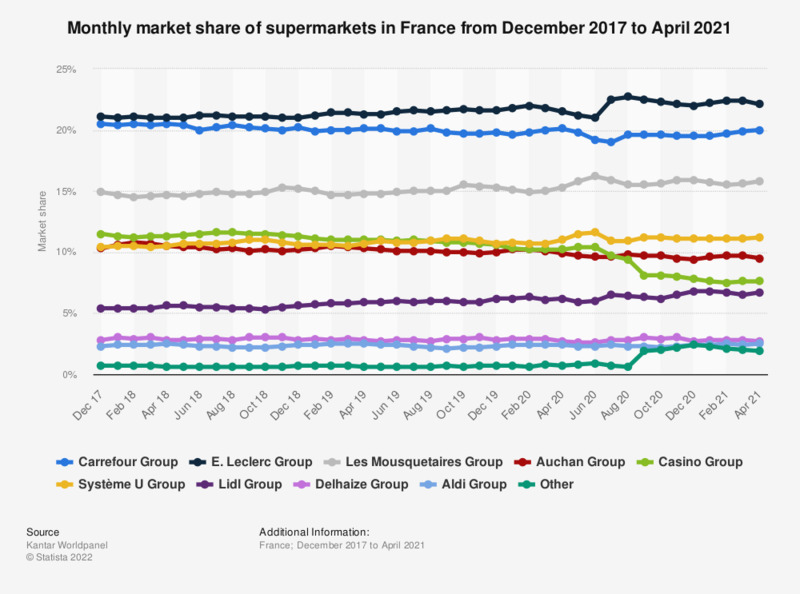 This statistic shows the market share of grocery stores in France for the 12 weeks ending March 12, 2019. E. Leclerc holds the largest market share with 21.4 percent, followed by Carrefour with a 20 percent share. The grocery retail landscape in France has been dominated by the Leclerc Group and Carrefour group, who have been fighting neck in neck for the lead position. Up until January 2017, Carrefour had the largest share of the grocery retail market, at which point Leclerc overtook it to become the largest supermarket in France. Carrefour, however, is also the most valuable French food brand. France has one of the largest markets for online grocery shopping worldwide due to the early introduction of drive-through collection services, second only to the United Kingdom within Europe. The share of individuals who have purchased food or groceries online is thus increasing year on year. The source adds the following information: "The Grocery Market Share data is derived from Kantar Worldpanel research covering the household grocery purchasing habits of 20,000 demographically representative households in France for their consumption at home. All data is based on the value of items being purchased by these consumers."